Rice, especially brown rice, is a major food staple consumed by over half the world's population every day. 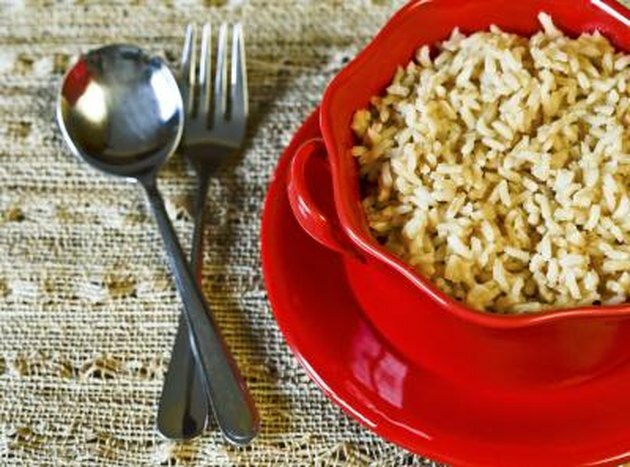 In fact, in some countries rice provides more than half the daily calories -- not surprising since brown rice is brimming with nutrients. It's not only fiber rich, but also protein-rich with only a small amount of fat. It provides vitamin E and B vitamins and minerals such as iron, calcium, magnesium, phosphorus, potassium, sodium and zinc. By eating brown rice every day as part of a well-balanced diet, you can help ensure your body's good health. Brown rice is packed with fiber, which helps maintain bowel regularity and is linked to reduced risk of heart disease, cancer, obesity and Type 2 diabetes. Eating brown rice also helps maintain healthy cholesterol and blood sugar levels and assists in lowering blood pressure and decreasing your risk of hardening of the arteries. The USDA MyPlate guidelines suggest that at least half your daily grain consumption should come from whole grains. MyPlate guidelines also recommend a daily grain intake of 6 ounces for women ages 19 to 50 and 5 ounces for women over age 51. For men, a daily intake of 8 ounces is recommended for ages 19 to 30 years, 7 ounces for men ages 31 to 50, and 6 ounces for men over age 51.